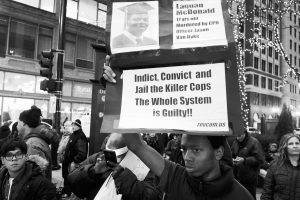 In Chicago, the Nov. 24 release of long-suppressed video of the Oct. 2014 police shooting of 17-year-old Laquan McDonald sparked new outrage and led to a series of largely youth-led downtown demonstrations that significantly affected holiday sales at the elite stores on the Magnificent Mile. It was clear from the video that Laquan presented no threat to the police, who had him outnumbered and cornered, nor to the public, as the location was an isolated Southwest Side truck yard. Nevertheless, Chicago Police Dept. (CPD) officer Jason Van Dyke decided to empty his 9mm semi-automatic pistol into Laquan’s prone body. Van Dyke’s first shot had knocked him to the ground. Yet here was one more “law enforcer” driven by the same racism that led to the murder of Trayvon Martin by George Zimmerman, the murder of Michael Brown by Darren Wilson and so many more. Van Dyke fired until Laquan’s body was smoking; 16 shots in total. The CPD “responded” to community outrage and protest on Dec. 26 by murdering 55-year-old activist Bettie Jones and 19-year-old Quintonio LeGrier, after LeGrier’s family had called 911 to request help with his mental health issues. Protests continue. While Chicago Mayor Rahm Emanuel shows no sign of bowing to protesters’ demands he resign, he is clearly feeling pressure to deal with the scandal. Only as the video was to be released did Cook County States Attorney Anita Alvarez indict Van Dyke on charges of first-degree murder and official misconduct. (The first time an on-duty CPD officer has been so charged since 1980, when three cops beat a man to death for smoking on a train.) Police Superintendent Garry McCarthy, who refused to resign, was fired. Democratic Party officials have distanced themselves from Alvarez and will challenge her upcoming re-election bid. The Department of Justice (DOJ) has also announced an investigation of the Chicago Police Department. None of this would have happened without mass protest. The Chicago Police have a long history of brutality. There is former detective Jon Burge, who, with other cops, tortured hundreds of Black men and boys; the police murders of Black Panthers Fred Hampton and Mark Clark; the “police riot” at the 1968 Democratic Convention; and the Chicago practice of dropping Black youth off in known racist areas to be beaten and possibly killed. This inhuman history hardly distinguishes the Chicago Police from those of Milwaukee, Los Angeles, New Orleans, New York, Ferguson, Baltimore, Philadelphia or all the other scandal-plagued departments that have served the aims of the ruling class. Police brutality is the “Abandon All Hope!” gateway into the genocidal prison system, too. The youth who challenge all by raising the banner of Black Lives Matter begin with the clear-eyed understanding that the current state of this society is the result of hundreds of years of development of a racist capitalism. The young women and LGBTQI youth who provide leadership and energy to this movement represent something new, as well, and mark Black Lives Matter as a development from previous movements. This has led to tensions in some demonstrations, as in Chicago when older activists have tried to downplay the presence of these new voices. The ruling class would like nothing better than to see the Black Lives Matter movement die. They are being judged for their present inhuman actions, and for the entire history of cruelty, genocide, and slavery that has brought them to the eminence they have enjoyed up to now. This movement and the generation of Black youth it springs from are putting American civilization on trial. 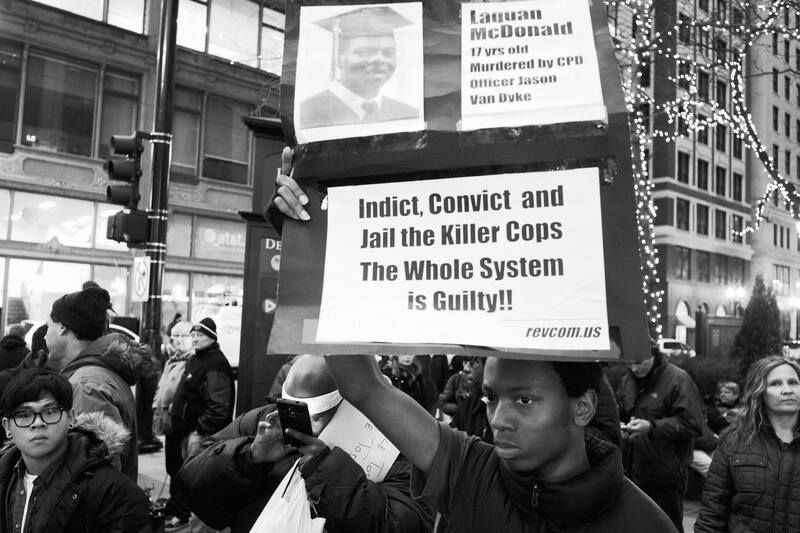 This entry was posted in Articles and tagged American Civilization on Trial, Anita Alvarez, Assata's Daughters, Bettie Jones, Black Lives Matter, Black Youth Project 100, Chicago, Chicago Mayor Rahm Emanuel, Chicago Police Department, Chicago Police Superintendent Garry McCarthy, Darren Wilson, demonstrations, Department of Justice, DOJ, Fred Hampton, George Zimmerman, Jason Van Dyke, Jon Burge, Laquan McDonald, LGBTQI, livable wage, Mark Clark, Michael Brown, Minimum wage, police murders, prison industrial complex, Quintonio LeGrier, racism, torture, Trayvon Martin, We Charge Genocide. Bookmark the permalink.